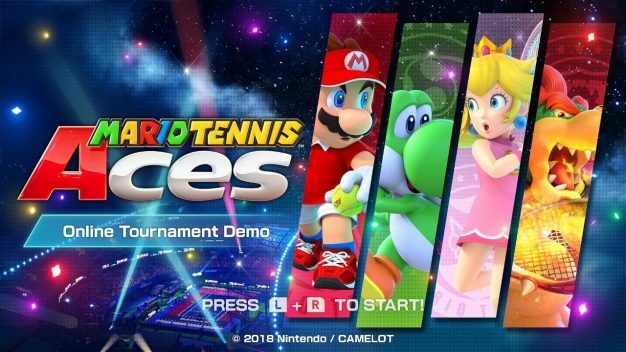 How is everyone liking the Mario Tennis Aces online tournament going on this weekend? I downloaded the early demo of the game and decided to talk about my first impressions of the game. Let me start off by saying that when Mario Tennis Aces was first announced earlier this year, I felt a slight uneasiness with the game. 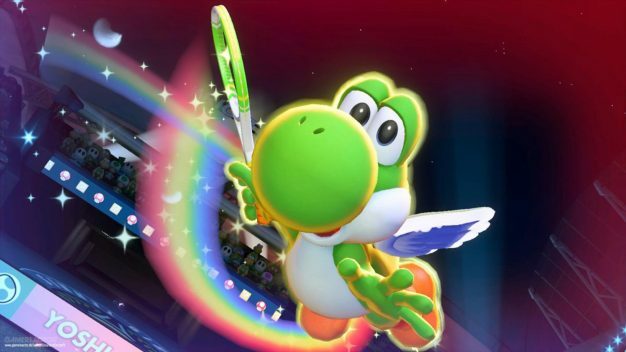 Granted, I liked playing Mario Tennis for the N64 and the Gamecube’s Mario Power Tennis was a pretty enjoyable experience as well, but I felt the super moves and other new aiming shots seemed a little gimmicky with not a lot of fun innovation coming to the series. The nice thing I noticed when starting the game is that when the full game releases on June 22nd, there will be a mode where you play standard tennis with the Mario characters. No special moves, KO’s, or any of that nonsense. However, in this pre-release tournament, you can only play the special mode either against AI or online against other players. Each match gives you a certain amount of points for how you do and whether you win or not. It says that the players who accumulate the most points will be revealed on the official website afterward since there is no leaderboard in-game. For the demo, you can start out playing as four characters; Mario, Peach, Yoshi, and Bowser, with five others unlocking by getting the right amount of points. The size and body make of each character decide what class they will be in. For example, Mario is an all around, Yoshi is speedy, and Bowser is a big power guy. I mostly played as Yoshi, but from the little I played as Mario I did not notice a difference between the two besides the animations for the super moves. As for the super moves, I still stand by that they are gimmicky and not really a fun feature. Whenever the ball is coming to your side of the court, no matter how far away you are you just press L and your character will start their animation and let you aim your shot to barrage your opponent. You can either aim away which is pretty much a guaranteed point as long as you don’t aim out of bounds, or straight at your opponent which is also almost a guaranteed point. If the ball is near them, they get a chance to block the shot, but I have yet to see anyone time this correctly since the ball is traveling so fast at you. Should they decide to take a swing at the ball at the wrong time, it will break their racket. When this happens twice, they run out of rackets and are KO’d, an automatic forfeit from the match. This is probably my least favorite part of the demo. I have not had a KO on me yet, but I did it to someone to win in the first round of serving because we hit it back and forth so much. It took the fun out of what was turning into a very competitive match. To get special moves, you fill up your power meter volleying the ball back and forth. You drain that meter when using the aim shots, trick shots, and slowing down time to get to a ball that would normally be out of your reach. In all honesty, I like the slow-time mechanic, but the rest are not great. Trick shots are very finicky. You use them by either pressing the right stick left, right, or back, or double pressing X which just happened accidentally to me too many times because of the many different shots you can hit now. The aim shots are done by getting to the star markers on the ground and are pretty much a lower super move. They are a little slower, but they damage your opponent’s rackets instead of outright breaking them. When the game comes out, I can see myself playing the standard play mostly. What I do like are the different shots you have now. There are three different hits you can take on a ball by simply pressing a button, while also having the ability to do a drop shot which leaves the ball with a very short bounce in front of the opponent which can be very uncomfortable when expecting it to come all the way back. As for the online play, it is fun until the lag hits. It completely ruins the experience. Even when playing on a stable connection, all of my inputs would be 2 seconds behind me pressing the button, leading to multiple screw ups and taking any fun out of the game. Now when it is working on both sides, it is a very fun game, but if those problems are not taken care of before release, I see this being a game where I focus on the campaign with local multiplayer. Overall, I have had a fun time playing the demo tournament. Besides the super moves and connection issues, the game plays pretty smooth. I am excited to see the entire cast of characters that will be available to play because there is a lot of room left on the character select screen. For playing this demo, you unlock Mario’s classic outfit for the main game, so I am hoping each character has multiple costumes as well. Also, now until the 21st, anyone who preorders the game on Nintendo’s eShop gets double the reward coins, so I ended up doing that. While I am not blown away by the game, I am pretty excited for the release later this month. I don’t think it will light anyone’s world on fire, but it should be a fun time.